Beauty-today that one little world has as many facets as a diamond. it means fashion magazines, models, and movie stars. It means a thousand and one products and services, from cosmetics and the latest fashions, to hair stylists and figure experts. It even means controversy, at least to a few members of Women's Lib, who say that womanly beauty is overstressed. But the desire to be attractive is as natural and timeless as human nature itself. This book, then takes a fresh and happy approach to skin and hair care, make-up and clothes, diet and exercise. And, as a bonus, there's a chapter on the intriguing relationship between looks and self-image, and an in-depth report on cosmetic surgery. The desire to be beautiful-or at least without noticeable imperfections-seems to be as universal among women as the desire to succeed is among men....But should we want to be beautiful? We all know what the most militant members of Women's Lib feel on this score....Is there anything in what the militants say? NO, if what they really mean is that we should neglect our looks entirely, just let ourselves go, and devote our energies to self-expression. It's funny 'cause it's true. 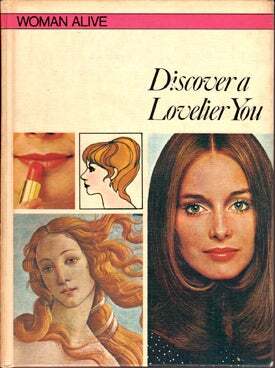 The caption for this picture read, "At the beginning, all of us experiment uncertainly with the paraphernalia of feminine adornment-and who can't remember the delight and excitement of staring into a mirror at a face that is clearly your own, but subtly changed by the unfamiliar magic of the lipstick." This was actually in the book as a "Do" not a "Don't" with the caption reading, "This hairpiece creates an elaborate coiffure for that special evening." What kind of evening? A black-tie cow milking? A night at the circus? Being Tyra Banks at panel? I was actually disappointed that there weren't better, more exact makeup and hair tips. (Um, how could they not explain back combing, considering the era?) This was about as specific as they got, which seems to be an example of how to go from Woody Allen to RuPaul in 10 steps. That's like putting you on the fast track to Botoxville. This is a color chart of some kind. I can't make heads or tails of it. Dark skin? Light skin? Wha!? Tell me what friggin' color I'm supposed to wear and in what season.